(Washington, DC) — President George H. W. Bush and his senior advisors ignored a steadily growing stream of alarms from a key U. S. intelligence agency in the week before Saddam Hussein’s invasion of Kuwait, a former CIA analyst charges in a new book. Eddington makes this and other charges in his newly published book, Long Strange Journey: An Intelligence Memoir, an account of his nearly nine years at the CIA. Eddington’s tenure at the Agency spanned the transition from the Cold War to the new era of American interventionism in the Persian Gulf and the Balkans. The book draws upon Eddington’s direct experience reporting on the events described in the book, as well as thousands of pages of previously classified documents secured through litigation he pursued during the last decade with the help of Washington, D.C. attorney Mark S. Zaid (www.MarkZaid.com). How the CIA’s post-Desert Storm tilt towards deepening its support to Pentagon operations compromised the Agency’s independence, and the role the CIA played in supporting Pentagon operations in Haiti and the Balkans in the 1990’s. Eddington’s book has drawn praise from government watchdog groups and former Congressional investigators. “This is a ‘must read’ for the Obama White House and concerned citizens, alike,” said Burt Wides, who headed the Church Committee’s investigations of the CIA and was Special Counsel to President Carter for oversight of all U.S. intelligence agencies. “Partly an examination of Eddington’s life as an analyst and partly a story of his difficulties in trying to convince officials to acknowledge the chemical-agent danger, Long Strange Journey is a valuable narrative about a talented young officer’s experiences–and anguish–while serving in the middle ranks of America’s premier secret agency,” said Dr. Loch Johnson, Regents Professor at the University of Georgia and also a former Church Committee investigator. 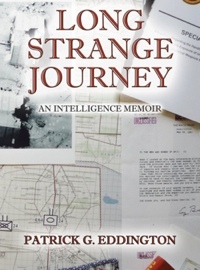 “Long Strange Journey gives us a peek into the bowels of the intelligence community, and it isn’t a pretty picture…Part spy thriller, part scandal, part love story, this book will make you hope there are more like him fighting for truth and justice behind the CIA’s veil of secrecy,” said Mike German, Senior Policy Counsel for National Security and Civil Liberties at the ACLU. My brother is a Gulf War Veteran. When he returned from the war my family and I immediately began to notice he was always ill. One appointment at the VA turned into several appointments and days of being ill turned into years. He has had a very hard time maintaining a job due to the high number of times he has called in sick to travel to the VA. As I write this today, he is dealing as best he can until his next appointment this Thursday. His condition is worsening, and I fear the worst. After speaking with him today I felt my life crumbling around me because, I am so helpless and angry at our government for not doing right by him. I decided to use the internet to see if I could find a way to make some sense of all this, and then I found your article in "veteranstoday." I am appalled to learn that our government is withholding information that could bring some light to the condition of our veterans, and yet I'm not surprised. How could they do this and sleep at night? My brother has not had a healthy day in his life since he returned, and it sickens me to know our government "chooses" to do nothing. It's a slap in the face to all who have made this sacrifice for their country. At the very least our government should "man up" by admitting their mistakes and try to make the last days of these veterans as comfortable as possible. My brother is suffering physically. The stress of not being able to work to provide for himself is putting more strain on him than most could even imagine. Thank you for your contribution and the sacrifices you have made to bring the truth to light. I will purchase your book and continue in my efforts to help my brother.